CVSO-WI Past President, Bill Rosenau (left), passes the gavel to incoming President, Joe Aulik (right), as the annual CVSO Fall Conference held in Green Lake, WI. The County Veterans Service Officers of Wisconsin salute you and thank you for your service to our veterans! Note:If you have problems viewing this page, make sure you are using the most current version of your internet browser as this site is desktop and mobile device compatible. Welcome to the County Veterans Service Officers Association of Wisconsin Homepage! 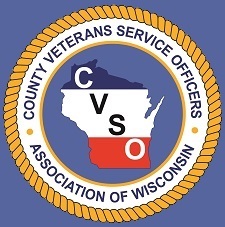 The County Veterans Service Officer Association of Wisconsin (CVSOAWI) is an organization of professional veterans advocates. In Wisconsin the County Veterans Service Officer plays a critical role in the veteran's advocacy system and is often the initial contact in the community for veterans services. Through the County Veterans Service Officer the CVSOAWI is committed to Wisconsin counties to provide a vital and efficient system of services and advocacy to veterans, their dependents, and survivors. The CVSOAWI promotes legislation and policy at both the state and federal levels that is supportive of veterans rights and issues that are in harmony with our national obligation to veterans of the United States armed forces. The association provides a medium for the exchange of ideas and information, training, and support to facilitate the delivery of services to nearly 488,000 veterans. The CVSOAWI recognizes the importance and merit of the congressionally charted veterans service organizations, and is committed to fostering a mutually beneficial relationship for the common good of all veterans. It is the intent of this organization that every veteran residing in Wisconsin receives the benefits and services to which they are entitled by law and moral obligation.